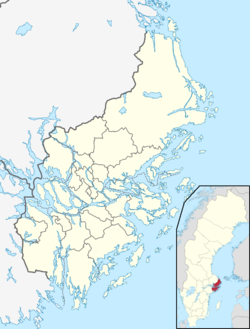 Dalarö is a locality situated in Haninge Municipality, Stockholm County, Sweden with 1,199 inhabitants in 2010. It is situated south-east of Stockholm and is part of Metropolitan Stockholm and serves as a recreational summer spot for Stockholmers. At the beginning of the year 2004, the automobile company Volvo used the town for the unconventional The Mystery of Dalarö advertising campaign. Dalarö is Haninge Municipality's oldest locality, originally an old maritime pilot and customs community. Today Dalarö is largely characterized by the developments which were added in the late 1800s, when the area became a popular summer resort for Stockholmers. Dalarö has long been home to Swedish high society's seaside houses. Since the 19th century, the town of Dalarö has been a fashionable holiday resort for the international upper class. Dalarö is also a desirable family resort for the wealthy. The historical valuable buildings are of national interest. Dalarö and the surrounding built-up area has a diverse year-round[clarification needed] and summer cottages. During the summer months Dalarö is frequented by a large number of tourists. Wikimedia Commons has media related to Dalarö. This page was last edited on 19 September 2017, at 23:36 (UTC).